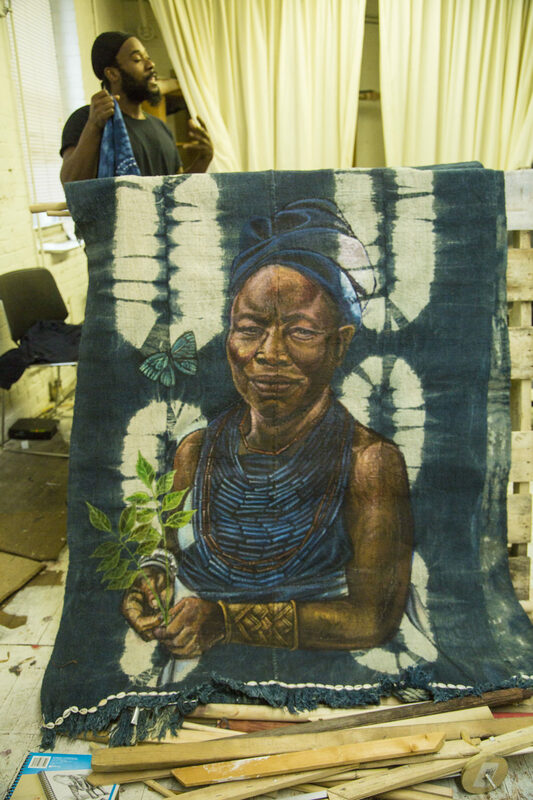 Her face, rendered with stunning accuracy and realism, seems to come alive as the fabric shifts. Hamilton hand dyed the fabric and created the pattern with indigo before going over it with paint. He then embroidered the fabric with yarn dyed with kola nuts, a mixture Hamilton makes himself. This intensive hands-on process represents a portion of what Hamilton’s newest endeavor, "The Founder’s Project," required for completion. "The Founder's Project" will be on display at the Bruce C. Bolling Building in Roxbury starting on Friday, Nov. 16. 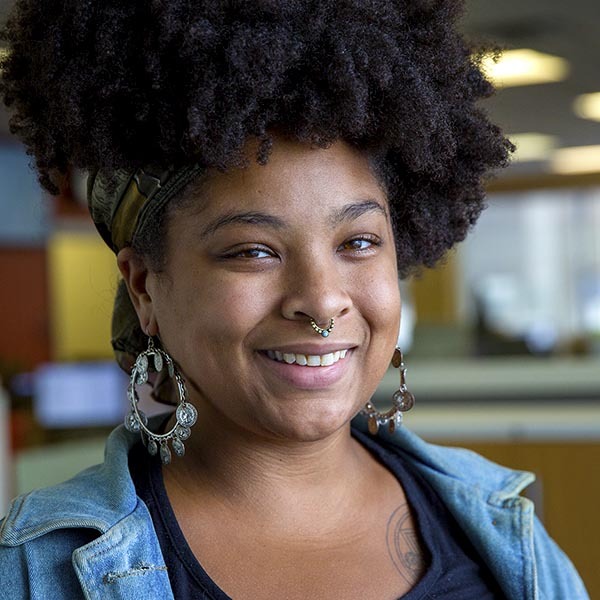 The project is part of Now + There's Public Art Accelerator program, which provides financial, technical and curatorial support to early- and mid-career artists in Boston. These traditional techniques contrasted with Hamilton’s more western based style of acrylic painting result in a new, unique take on what black art looks like and how it functions. 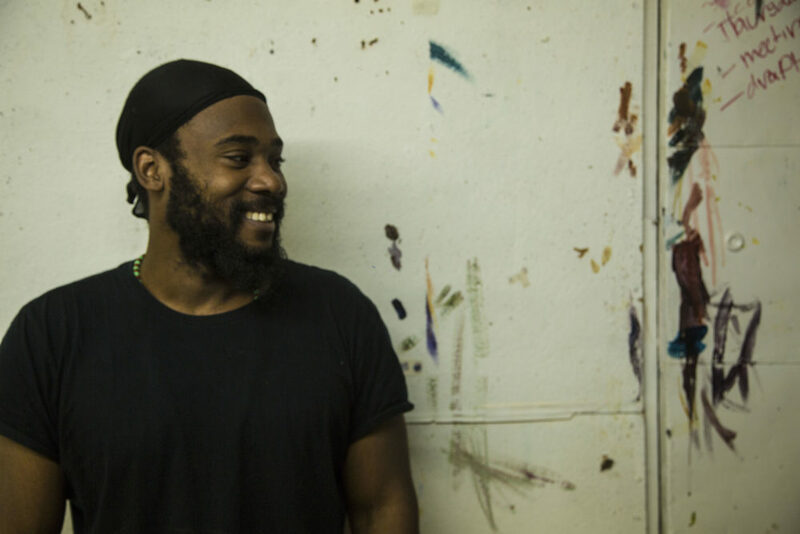 Hamilton spent almost a year in Nigeria in 2015 as a resident artist of Arts Connect International, an organization that builds equity and inclusion through the arts. 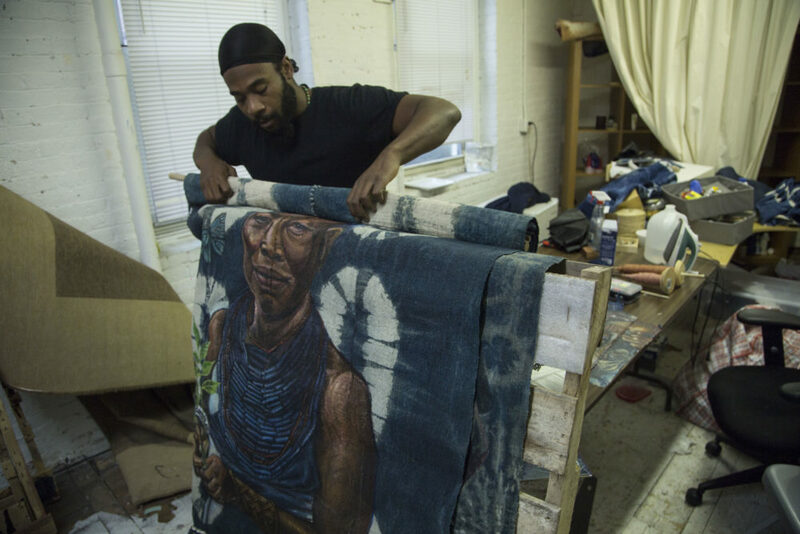 While in Nigeria, Hamilton built on his previous knowledge of traditional West African weaving and hand dyeing techniques, which he brought back with him and taught to Boston youth. Much of Hamilton’s previous work focuses on and centers West African ontology and spirituality and he employs his art to bring these stories to life. “When it comes to our African ancestors, a lot of times there's not a lot of education around that,” Hamilton pointed out. 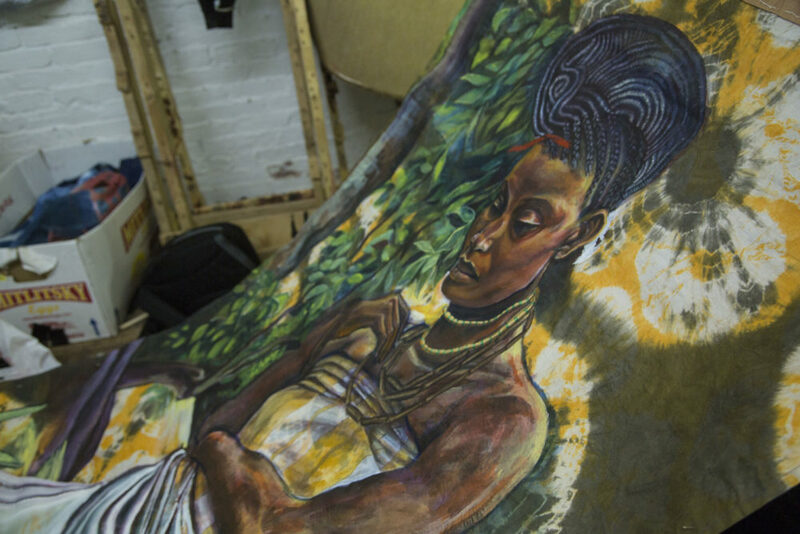 “It’s not something that’s covered in many Boston public schools.” His art takes aim at bridging that divide between peoples of the Afro-Diaspora and West and Central African traditions. While "The Founder’s Project" is a predominantly visual exhibit, Hamilton created an educational syllabus to accompany it in case educators wish to incorporate it into their curriculum. “I wanted to create something that others could educate around,” Hamilton said. Referencing the progenitors the portraits are modeled after, Hamilton said, “identities were forged around these figures, they had an incredible impact. All of these figures are incredibly important to contemporary African ethnic groups.” Though Hamilton uses the terms kings and queens to describe the historical focus of the project, he pointed out that our notions of what kingship means is a very Eurocentric interpretation of monarchy based on feudalism. “Kingship means something very different than what we’ve been taught,” Hamilton said. While kingship is a very complex, multi layered cultural aspect, the expectations and the personal trust put into kings and queens in many West and Central African traditions is very high. Hamilton pointed out that kingship or queenship was often times accompanied by great personal sacrifice and that the exclusivity of royalty seen so often in western monarchies doesn’t translate to many cultural traditions in west and central Africa. Through these stories of kings and queens, "The Founder’s Project" challenges the denigration of blackness in western culture while empowering black and brown youth with the knowledge of their ancestry. “These installations are accessible to black communities in Boston and they represent black communities in Boston,” Hamilton said. “They now have a place where they can see these empowering images of them while gaining a deeper understanding about our African past and how it still impacts our realities."